*Grrrraaaawwww* That looks soooooo yummy!!! Is the other person being sarcastic? That honestly looks the opposite of yummy. Like something you’d see on “CSI: Dublin”. Yikes. I will say this: My Nokia 7610 camera phone skews towards the blue spectrum. In the original light at lunch, it was very warm and happy looking. When I got home and saw how the camera viewed it, the gravy looked frightening to me. looks yummy to me, though seems a bit contrived, sort of gourmet. must be the garnishing. stick to pubs that don’t use fancy silverware or plates. Thanks for validating me Jen; I was feeling like the odd one out. I agree, the gravy does look a little, well, congealed. And what is that lumpy matter on the left? It might be … parts. And vegetarians are afraid of parts. But the mashed potatoes and lovely garnish looks delightful. 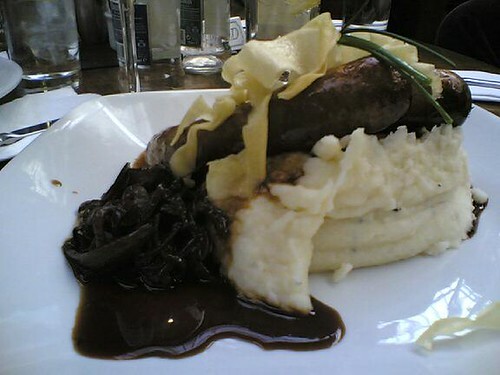 Can you order Bangers and Mash hold the Bangers? Can you order Shepherd’s Pie hold the Shep? Can you order just Mushy Peas? I really do like mushy peas!